PlanbookEdu makes it easy to mark certain calendar days as Off Days. An Off Day is any day where you don't need lesson plans. It could be something scheduled like a vacation or field trip, or unscheduled such as a snow day. There are two ways to add Off Days to your plans: you can add several days at once or you can select the day right from the calendar as you are planning. At any time, you can click on "Planbooks" in the blue navigation bar to see a list of all of your planbooks. For the planbook you are working in, click "More" under "Actions". 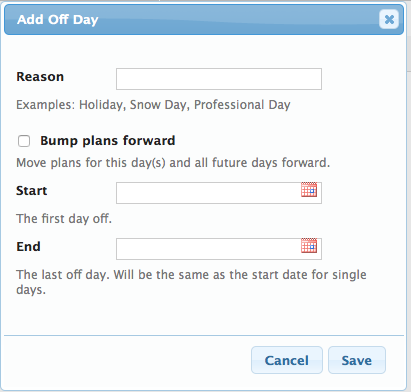 After clicking "More", select "Off Days". In the next screen, you will see two buttons: "Add Off Day" and "Add US Holidays". 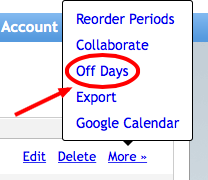 Choosing "Add Off Day" will allow you to enter any time off, whether it be a single day or a range of days. You will also have the option of bumping your plans forward. 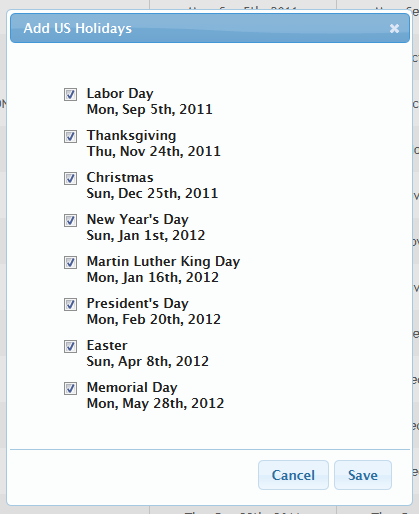 Selecting "Add US Holidays" will give you a list of common US holidays. You can choose not to include any by de-selecting them. Once you are done, you will have a list of all the Off Days you've added. You can edit or remove any of them. 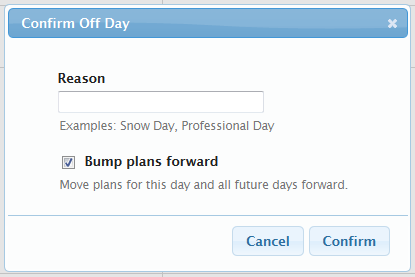 You can also add Off Days directly from the calendar while editing your plans. Click the cog icon next to the day name. Select "Off Day" and you can then add the reason for it. There is also an option to bump any plans for that day. If you choose not to bump, the plans will be removed and all other plans will remain in place. An Off Day can also be removed directly from your calendar. Clicking on the cog icon for an Off Day will present you with a menu with just one option: Remove Off Day.